Come enjoy the family getaway you’ve been needing for too long. This lakefront Marina View home features a massive Great Room with views of the lake from the living room area, which also has a large stone fireplace. The dining area also has tall windows, and the adjoining kitchen features a large island counter in the center. 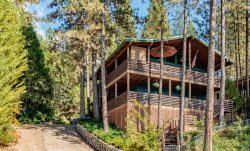 The home comfortably accommodates 12 people, with 4 bedrooms, 3 full bathrooms, and 1 half-bath, all in a large 5000-square feet home with fantastic views and central air conditioning. The master bedroom has a king bed, as do 2 more bedrooms; another bedroom has two sets of bunk beds, and 2 trundle beds (6 twins total). There are also two double sofa beds. Other Amenities include 2 TVs with Cable, Central Air & Heat, an outdoor deck and dining area, a washer and dryer, game room, foos ball table, and a gas grill. The home is in the Marina View area, and has a walkway down to the boat slip on the lake.